ADI manufactures the 6000 series of feeder controllers designed to control any ADI feeder drive units as well as most other manufacturer's models. The controllers are available in 120 Volt and 240 Volt operations. They are designed for basic vibratory feeder operation while fully capable of advanced operation. ADI also offers advanced vibratory feeder controllers capable of controlling a series of feeders and components as well as automatically searching for optimal operating frequencies and dynamic bowl tuning through electrical controls. The 6000 Series of controllers will work with any 120 Volt vibratoryADI Product with an electromagnetic coil. These are not meant for permanent magnet motors. Use the 9150 Feeder Controller for the ADI Dyna-Mite Vibrators. Use the 4500E Feeder Controller to control permanent magnet motors on products such as Orienting Rolls and Centrifeed Centrifugal Feeders. 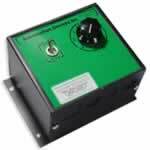 The 6000 series amplitude controllers are used to vary the amplitude of vibration in vibratory feeders, linear feeders, electric industrial vibrators and similar devices. The 4500E series DC motor / Centrifeed amplitude controllers are designed to control permanent magnet motors such as Centrifeed Centrifugal Feeders and Orienting Rollers.